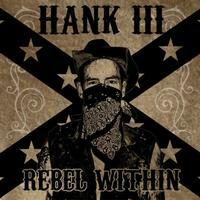 The outlaw spirit is alive and well in the latest release of Rebel Within from Hank III. It's wallowing and raw sound offers die hard fans a glimpse of classic Hank III. The album features top standout tracks such as the hypnotically entranced "Karmageddon" and the rousing tune "Tore Up And Loud"...all showcasing the true rebel within.